Despite being a small player in the palm oil industry, BW Plantation has gained investor interest as a quality company with strong growth prospects. Rats are a common problem for plantation companies, hurting the trees. Most use traps or poison to eliminate them. PT BW Plantation instead uses owls to keep rats at bay. 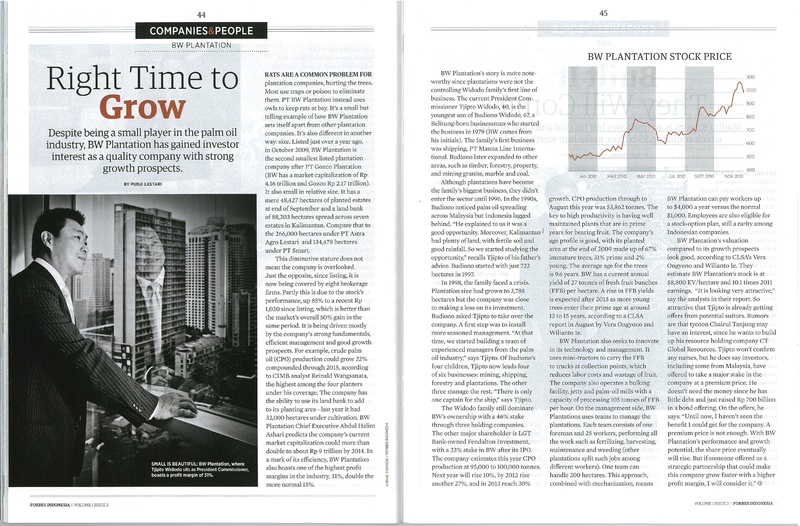 It’s a small but telling example of how BW Plantation sets itself apart from other plantation companies. It’s also different in another way: size. Listed just over a year ago, in October 2009, BW Plantation is the second smallest listed plantation company after PT Gozco Plantation (BW has a market capitalization of Rp 4.16 trillion and Gozco Rp 2.17 trillion ). It also small in relative size. It has a mere 46,048 hectares of planted estates at end of June and a land bank of 90,582 hectares spread across seven estates in Kalimantan. Compare that to the 266,000 hectares under PT Astra Agro Lestari and 134,478 hectares under PT Smart. This diminutive stature does not mean the company is overlooked. Just the opposite, since listing, it is now being covered by eight brokerage firms. Partly this is due to the stock’s performance, up 85% to a recent Rp 1,020 since listing, which is better than the market’s overall 50% gain in the same period. It is being driven mostly by the company’s strong fundamentals, efficient management and good growth prospects. For example, crude palm oil (CPO) production could grow 22% compounded through 2015, according to CIMB analyst Reinald Wangsanata, the highest among the four planters under his coverage. The company has the ability to use its land bank to add to its planting area — last year it had 32,000 hectares under cultivation. BW Plantation Chief Executive Abdul Halim Ashari predicts the company’s current market capitalization could more than double to about Rp 9 trillion by 2014. In a mark of its efficiency, BW Plantation also boasts one of the highest profit margins in the industry, 31%, double the more normal 15%. BW Plantation’s story is more noteworthy since plantations were not the controlling Widodo family’s first line of business. The current President Commissioner Tjipto Widodo, 40, is the youngest son of Budiono Widodo, 67, a Belitung-born businessman who started the business in 1979 (BW comes from his initials). The family’s first business was shipping, PT Manna Line International. Budiono later expanded to other areas, such as timber, forestry, property, and mining granite, marble and coal. Although plantations have become the family’s biggest business, they didn’t enter the sector until 1996. In the 1990s, Budiono noticed palm oil spreading across Malaysia but Indonesia lagged behind. “He explained to us it was a good opportunity. Moreover, Kalimantan had plenty of land, with fertile soil and good rainfall. So we started studying the opportunity,” recalls Tjipto of his father’s advice. Budiono started with just 722 hectares in 1997. In 1998, the family faced a crisis. Plantation size had grown to 3,788 hectares but the company was close to making a loss on its investment. Budiono asked Tjipto to take over the company. A first step was to install more seasoned management. “At that time, we started building a team of experienced managers from the palm oil industry,” says Tjipto. Of Budiono’s four children, Tjipto now leads four of six businesses: mining, shipping, forestry and plantations. The other three manage the rest. “There is only one captain for the ship,” says Tjipto. The Widodo family still dominate BW’s ownership with a 46% stake through three holding companies. The other major shareholder is LGT Bank-owned Fendalton Investment, with a 23% stake in BW after its IPO. The company estimates this year CPO production at 95,000 to 100,000 tonnes. Next year will rise 10%, by 2012 rise another 27%, and in 2013 reach 30% growth. CPO production through to July this year was 46,712 tonnes. The key to high productivity is having well maintained plants that are in prime years for bearing fruit. The company’s age profile is good, with its planted area at the end of 2009 made up of 67% immature trees, 31% prime and 2% young. The average age for the trees is 9.6 years. BW has a current annual yield of 27 tonnes of fresh fruit bunches (FFB) per hectare. A rise in FFB yields is expected after 2013 as more young trees enter their prime age at around 13 to 15 years, according to a CLSA report in August by Vera Ongyono and Wilianto Ie. BW Plantation also seeks to innovate in its technology and management. It uses mini-tractors to carry the FFB to trucks at collection points, which reduces labor costs and wastage of fruit. The company also operates a bulking facility, jetty and palm-oil mills with a capacity of processing 105 tonnes of FFB per hour. On the management side, BW Plantations uses teams to manage the plantations. Each team consists of one foreman and 25 workers, performing the all the work such as fertilizing, harvesting, maintenance and weeding (other plantations split such jobs among different workers). One team can handle 500 hectares. This approach, combined with mechanization, means BW Plantation can pay workers up to $4,000 a year versus the normal $1,000. All employees are also eligible for a stock-option plan, still a rarity among Indonesian companies. 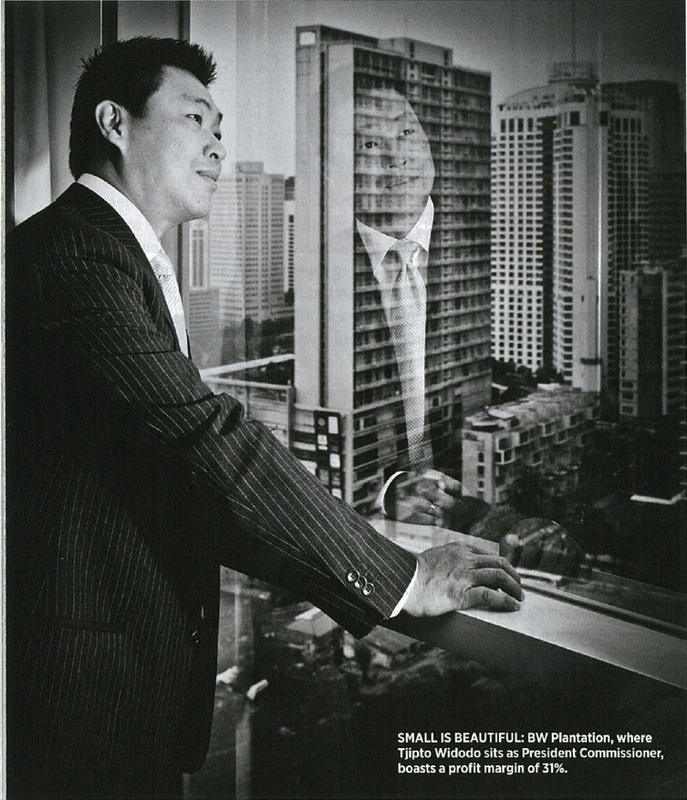 * This story appears in December 2010, special issue, of Forbes Indonesia magazine. This entry was posted in Companies, People, Publications and tagged Astra Agro Lestari, Budiono Widodo, BW Plantation, BWPT, CPO, crude palm oil, Fendalton Investment, FFB, fresh fruit bunches, Gozco, palm oil, palm oil industry, plantation, PT Manna Line International, PT SMART, public companies, Tjipto Widodo by Pudji Lestari. Bookmark the permalink.